Nano's blog. - Horta - the wind is back! Title: Horta - the wind is back! Vinden er tilbake i Horta og noen regnbyger har gjort livet litt surere enn det burde være. Vi hadde dog en hyggelig kveld på restaurant i går sammen med Fred, Bjørn og Anne Grethe fra Dream Catcher. Temaet for restauranten er at man får servert maten ustekt, sammen med en flat stein som er veldig varm, og man steker maten da selv ved bordet - ikke helt ulikt fondu eller raclette. Vi har hatt en jobbedag for det meste i dag - Rønnaug har fått levert klesvasken og reparert noen klær. Jeg har tettet en liten sjøvannslekkasje fra den ene doen. Det har vært en del underholdning i havnen med båter som sliter med å få opp ankrene sine. Det har ikke vært så mange som har reist i dag fordi værprognosene nå er dårlige for turen til England - så både Dream Catcher og Hvorfor Ikke har avlyst sine planer om å dra og venter nå på utviklingen. Dagens bilde - Horta havn. Horta havn med øya Pico i bakgrunnen. Nano omtrent midt i bildet. 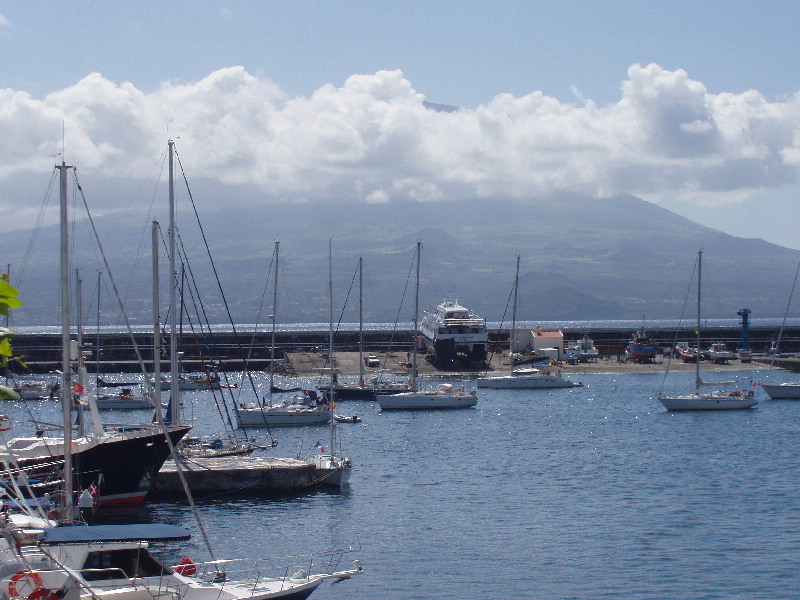 Horta harbour with the island Pico in the background. Nano about in the centre of the picture. The wind is back in Horta together with its friend the showers so our joy at the turn of the weather yesterday was short lived. We had a very nice meal out with Dream Catcher last night at a restaurant where the food comes raw, together with a very hot slab of lava on which one cooks the food - not unlike the concept of fondue or raclette. We have had a job-day today, though a lazy one it has to be said. Rønnaug has delivered the laundry and repaired some clothes while I have fixed a smal leak from one of the toilets and organized the gas bottles. There has been some free entertainment in the harbour watching boats trying to get their anchors up which have got caught in old discarded fishing gear. The boats who had planned to leave for England or Ireland are still here as the latest weather forecasts indicate that it is more prudent ot stay in harbour for a few days. Today's picture - Horta harbour.